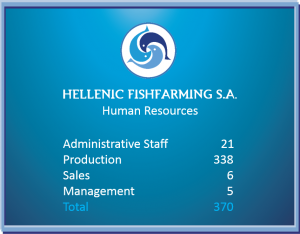 Human Resources | Hellenic Fishfarming S.A.
Human resources constitute a catalytic factor in the sustainable development and the efficiency of the Hellenic Fishfarming Group. The Group recognizes the value of its workforce contribution to its successful course, and is committed to ensure the continuous development and progress of its employees at a professional level. In parallel, pursuing maximum productivity and performance on behalf of the personnel, the Group has prioritized the continuous development of its employees’ technical skills and abilities. This is accomplished through their participation in training seminars and educational programs on their field of expertise. In the context of continuous employee training, the Group also focuses on vocational training regarding health and safety issues. 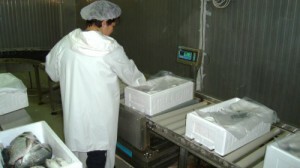 All personnel is trained on a systematic basis, through an especially modified intra-corporate programme of European standards, which ensures that all necessary health conditions are adhered to in all facilities, and that programmes of strict control are applied duringthe production process. A primary concern of the Group is to promote and reward the employees for their skills and to continuously offer career opportunities for their development within the Group. Recently, the Group adopted a hiring policy regarding students and graduates of fish farming schools, which offers them the ability to gain practical experience in its facilities. This is a strategic move, as these trained students will comprise the Group’s future executives.